Standards & Qualities Report / S.I.P. A very warm welcome to our website. Thank you for taking the time to visit us. I do hope that you find the information you are looking for. I am John McKay and I have been Headteacher here in The Grammar since 2008. Previously I had been a DHT and a PT of Geography in Dalziel High School in Motherwell, and prior to that I was an APT Curriculum in St Margaret’s High School in Airdrie. My first permanent post was as a Geography teacher in Holy Cross High School in Hamilton. Prior to this I was a supply teacher and had a mercifully brief spell in Social Work! I am married and have 4 children and come to school for a rest. The young people who are with us in S5 and S6 are reaching the final stages of Secondary Education. This year and next will see them make choices regarding University, College, Apprenticeships and Work which they will then, hopefully, move into. Our roll is to support, engage, encourage and celebrate their successes with them. We hope that they find both this year and next stimulating, challenging and rewarding. We will use the website, school twitter account and groupcall to keep you informed of events and activities throughout the year. Welcome to S3! You survived your first two years of High school and now you are set on a personalised course of study. I wish you the very best in all of your subjects and would encourage you to get involved in clubs, volunteering etc in and outside of school. Good Luck as you start your learning journey and please continue to let us know how we can help and support you. Welcome to S4! The biggie! The most important year group in the school! Take it seriously, work hard, believe in yourself and be determined to succeed …but don’t stress. Keep lines of communication open and make sure you get the advice, help and support that you need. This section of the website will give you particular advice on 'Moving into S1' and will provide as much information about the school as possible, whilst keeping you up-to-date with key events. We will continue to develop this area of the website over the coming weeks and I hope that you find it both helpful and informative. 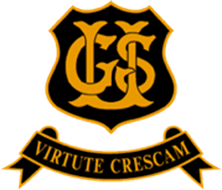 I am delighted to welcome you to Uddingston Grammar School’s website for S1. Whether you are visiting for the first time or are a regular visitor, I hope you find this section of the website useful and informative and that it provides a flavour of the achievements, opportunities and experiences we offer our pupils. If you have any enquiries at all regarding anything from attendance to the curriculum, school trips to uniform, please do not hesitate to contact us here at the school and we will be pleased to help. I am delighted to welcome you to Uddingston Grammar School’s website for S2. Whether you are visiting for the first time or are a regular visitor, I hope you find this section of the website useful and informative and that it provides a flavour of the achievements, opportunities and experiences we offer our pupils. S2 timeline to subject choices! August - Christmas - impress your carers and guardians as well as your teachers with your approach, attitude and commitment to your work January to February - speak with your Pupil Support teacher, your classroom teachers, your carers and guardians as we get ready to make subject choices After the Careers IDL, the Parents Evening, the Careers fair, go home and think - you will be interviewed by your Pupil Support teacher and then it is time to hand in your choice forms. After the SQA exams, you will start in S3 - good luck everyone! 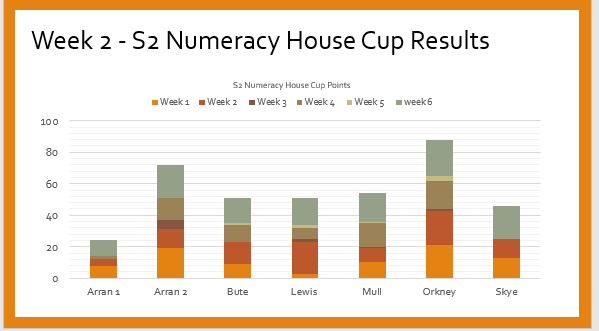 Well done to Orkney who are the current leaders in our S2 Numeracy Cup! The Visual Impairment Team is one of the three component teams which form the school’s approach to Support for Pupils. Pupil Support teachers support all pupils appropriately throughout their time in UGS, focussing on curricular, vocational, personal guidance and pupil Health and Wellbeing. SfL teachers provide support to ensure equitable access to learning for all pupils and advise staff on appropriate strategies for additional support.